The Hickory Crawdads open their tenth playoff run in 23 seasons as they start a three-game series with the West Virginia Power. Game one is at Appalachian Power Park in Charleston, WV with games two and three coming to L.P. Frans Stadium Friday and, if necessary, Saturday. 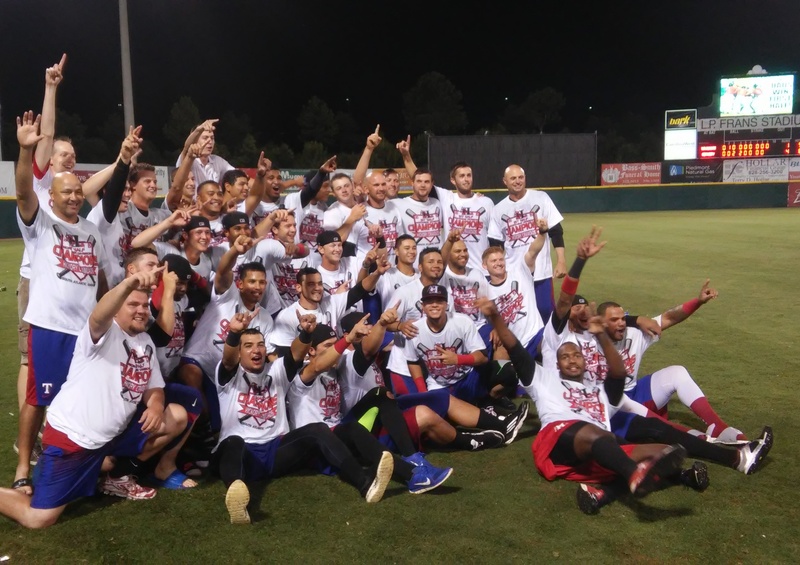 I took a moment to talk with Crawdads manager Corey Ragsdale about the series, as well as how the team ended the regular season heading into the playoffs. You guys have been waiting for the playoffs since June and here we are finally. First, let me ask how did the guys adjust to the second half when they knew they were going to be in the playoffs? There wasn’t really anything to play for, although they’re playing for development purposes. Ragsdale: I think they’ve done good. Yes, coming out of the break and had won the first half, it’s tough when the team goes and they decided at some point we’re going to win this thing and they win it. They completed their mission right there. It took a few days to kind of get back in line and refocus. They know now that there’s still work to do. There’s a job to do and I’ve got to get better for myself and continue to get better as a player. So it took a few days, but they’ve done very well. Obviously, we haven’t won as many ballgames this half as we did the first half, but overall they competed well and the efforts been there. Honestly, I’ve got no complaints. Obviously the big story of the year has been pitching, pitching, pitching. I’m guessing that looking ahead to West Virginia, that will be the make or break for y’all. Ragsdale: We’ve been very fortunate, yes. Our starters, our pitching has been very good all year. The first half of the year we were so good, primarily because of pitching and defense and timely hitting and things like that. But there’s no doubt that pitching and defense carried us. Going into the playoffs, we like our chances. We’re running out three guys that have had very good years. Whatever happens is going to happen, but we’ve got as good a shot as anybody. This first round we’re running Yohander (Mendez), (Ariel) Jurado and (Collin) Wiles out there 1-2-3. We like our chances. When y’all get here on Saturday, you’re going to win this because____? Ragsdale: In any playoff situation pitching and defense is always number one. We’re running three guys out there that we have a lot of confidence in and we’ve also got to play defense behind them. If we do that and take care of things that we need to, we’ve got a pretty good shot. You played West Virginia a couple of weeks ago after not seeing them since the first half, what did they bring that maybe has concerns for you? Ragsdale: I know we’re going to see (Yeudy) Garcia and (Stephen) Tarpley one-two. Obviously they’re two of the better pitchers in the league. So they’ve got some good arms going out as well. They probably do a little bit of the same stuff we do. Their pitching has probably carried them a little bit. I think they’ve swung it a little bit lately. When we played them the last time, we definitely weren’t playing our best. But, that’s no excuse. We’re definitely going to have to be on our A game. They’re playing very well. They’re steamrolling everybody they’ve played. We’re definitely going to have to come out and play our best games and play a good series to win. But, I think we’ll be alright. It’ll be a fun series. In the first half you had a pretty set group of guys but in the second half for various reasons you’ve had a lot of in and out. Ragsdale: We lost some of the guys in the first half, which is good. Some guys went up that did well. It is stuff, not necessarily about finding players. That group in the first half, they were all playing for the same thing. When you get an influx of new guys coming in there and switching around and all that stuff, it’s tough to make sure everybody’s on the same page all the time. That’s tough, but I think the guys that have come in, we’ve had great guys come in, guys that pretty much fall in line that want to do good and be good teammates. It hasn’t been hard on me or anything like that. I just think for them there’s a little bit of an adjustment for each guy having new teammates in and getting them comfortable. On the infield, I know you’ve toyed around with some different arrangements, especially at first, and trying to find a mix and the lineup. How do you see this playing out? In the outfield (Luke) Tendler, (Jairo) Beras, (Jose) Cardona with (Eduard) Pinto at DH? Ragsdale: I think Eric (Jenkins) gives us a nice new dimension. He’s obviously playing very well. He’ll be a guy that can possibly come off the bench and do something like that. He can run; he has very good speed. He’s shown some very good at bats and has shown some spark being in the leadoff position… he gives us something that, to be honest, we don’t have. So we’ll see over the next couple of days how that plays in and how that mixes in. We may try to get him some at bats and get him in there as well. We’ve still got a couple of days. With those new guys, we’ll just see what they can and what they can’t do. It’s not exactly the position you want to be in going into the playoffs, but we’ll get it done. The Hickory Crawdads scored three runs over the first two innings and made them stand up Wednesday night in a 3-2 road win over the Hagerstown (Md.) Suns. The victory was a milestone win for Crawdads manager Corey Ragsdale, as he set the club’s all-time mark for managerial wins at 229. The record was formerly held by Ragsdale’s predecessor Bill Richardson, who managed the team from 2010 to 2012. Ragsdale’s record with Hickory currently stands at 229-169. 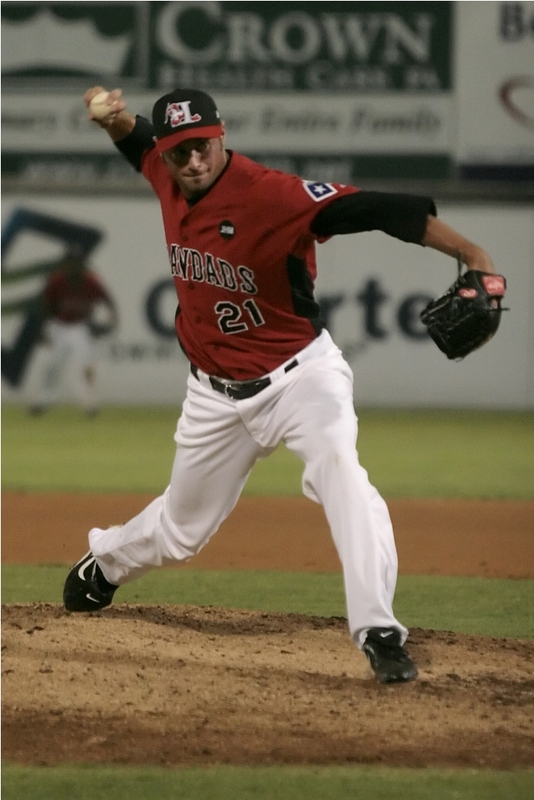 The native of Jonesboro, AR played with the Crawdads to conclude his career in 2009. He returned in 2011 as an assistant under Richardson, before taking the managerial reins for the first time in 2012 at Arizona Summer League Rangers, where the club won the league title. 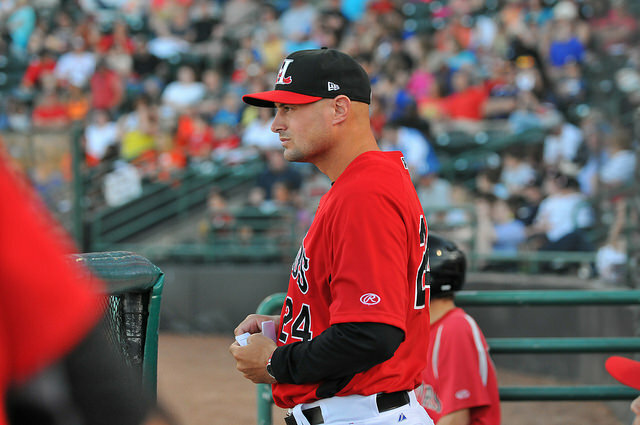 In Ragsdale’s first season as the manager in 2013, the Crawdads went 76-63, highlighted by a SAL record 178 homers by the power-laden lineup that included soon-to-be major leaguers Ryan Rua and Joey Gallo. 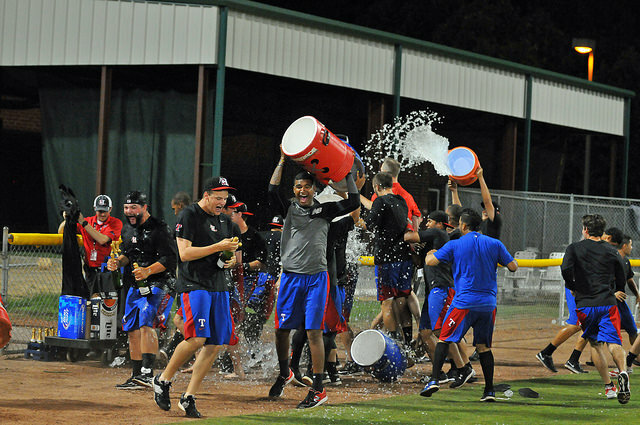 Last season, the Crawdads won 80 games for the first time since 2004. This year, the team has already clinched its first playoff spot since 2011 and currently holds the South Atlantic League’s best record. He was rewarded this season with a selection to manage the Northern Division in the SAL All-Star Game. Last week, I took a moment to interview Ragsdale about the impending record-breaking win, what he’s learned along the way over three seasons, and about some of the players that have already broken into the big leagues. I know you are going to play this down, but you’re coming up on the club mark for wins by a manager. I know you’re not going to say,” It’s not my wins and losses,” but it’s still a nice thing. You’ve had some guys that have come in here and played hard for you and that’s no small thing. A lot of that comes from what you and the coaching staff do. Ragsdale: I couldn’t care less about it, to be honest. I think what I do appreciate, as I look back on the last three years, is a couple of things. The players have done a great job. Obviously, they go out and perform. From the first year of that talented team, they went out played, and last year winning 80 games with the club. This year making the playoffs and winning the first half and are continuing to play pretty well, at times. I’ve had a lot of good players and a lot of good kids that play hard. And I think, as an organization, they’ve done a great job of getting players that can play. I’ve just been fortunate that I’m at a level where I’ve had a bunch of guys that are pretty good come through here the last three years. As far as the wins and losses go, I’ve just reaped some of the benefits of what the players and the organization as a whole has done. I’m lucky. I’m just here as a small part of it. I’m happy for the kids and happy they’ve won a lot of baseball games. What do you know now that you didn’t know three years ago, or how do you think you’ve gotten better? Ragsdale: Probably just with each individual player how tough it is a times and how you have to relate to each guy individually. You can’t just blanket certain ideas over everybody and expect guys to be able to react. You’ve got to be able to get into each and every guy and have different ways to say the same thing so that it clicks with certain guys. You’ve got to find out what motivates one guy and what motivates the next guy. I try to get them go out and compete every day because it’s a hard game. It’s a long, long season and these kids don’t necessarily know how to go about it each and every day. So, you’ve got to help them along the way. That’s what we’re here for. I think that’s probably the big thing is figuring out how to get each and every guy ready to go every day. We don’t get the job done every day, but most days, they go out and they’re ready to play and they’re motivated. Most days it’s pretty good. What did you learn from Bill when you were here in 2011? Ragsdale: A lot of stuff. Whether it was on-field stuff and how to go about things and just adding on to how to get guys ready at this level, being with him. Whether it’d be days off and whether it’d when to work out and when not to work out. Things like that – everyday things – everything from writing a lineup out. I remember how he used to write the lineup out and I still do it the same way. There’s a lot of things I take from him and I take from other guys that I’ve been around and that I’ve played for in the 16 years that I’ve been doing this. Bill helped me out a lot. He kind of took me under his wing a little bit and I am very appreciative of everything he did for me and allowed me to do when I was here with him. You want to keep doing this a few more years? Ragsdale: I love it. It’s a challenge some days. It’s a long season, but when you see the kids, when it clicks for those guys and they get the thing that you’ve been working on and they have success, it just makes you feel good. It’s fun to watch. It’s fun to be a part of. It’s fun to stand in the third-base box and to be a small part of the game still. Not that wins and losses matter, but we do put value in wins and kids learning how to win and kids wanting to win. So, it is fun to still be out there and have a small part of the game that goes on every day and to see the kids have success. It’s fun and I enjoy it a lot. How cool is it now to see the Claudios and Ruas and Gallos, etc. get to the big leagues and you having a part of it way back when? Ragsdale: I’m just happy for those guys and it does put a smile on your face when you see guys that work hard and see guys that have some talent and finally put some things together. You see guys like Claudio that maybe the talent wasn’t anything that jumped off the table, but he always came in and competed and you’re so happy for guys like that that have been able to have success and continued success and reach the big leagues and stay there, and hopefully stay there for a long time. It puts a smile on your face. I enjoy watching the games on TV – all those guys. Hopefully that’s the case for a lot of more years and a lot of more players can continue up the ladder and help our big league club win ballgames. In one of the weirder games of the season, the Hickory Crawdads rallied twice late to steal a 4-3 win over the Greenville (SC) Drive at L.P. Frans Stadium. Stymied in the first seven innings, the Crawdads scored single runs in the eighth and ninth to tie it. After falling behind again in the tenth, Greenville contributed to its own demise in the game with a “non-error” botched double play and a passed ball that factored into the outcome. Rock Shoulders force play tied it in the ninth and his blooper scored the tying and winning runs in the tenth. The game had two pitchers pinch-running and a third in the on-deck circle during the final two innings. It looked like a ho-hum night for the Crawdads offense as Drive starter Reed Reilley (seventh round, 2014 out of Cal-Poly San Louis Obispo) shut down the offense. He allowed four hits and walked one over 6.2 scoreless innings with four strikeouts. Meanwhile, the Drive scored twice in the fourth on back-to-back RBI doubles by Javier Guerra and Joseph Monge against starter Nick Gardewine. The Crawdads got a run back in the eighth when Josh Morgan singled in Jose Cardona. In the ninth, Luke Tendler tripled to start the inning. After Jonathan Meyer was hit by a pitch – and pinch-ran for by Chris Dula – Rock Shoulders hit a grounder deep into the hole a second for a force play that allowed Tendler to score. Juremi Profar’s single put runners on the corners, but Kuehl McEachern got Jose Cardona to fly out. Rafael Devers put the Drive ahead in the tenth with a solo homer to right off Scott Williams. Then, things got strange in the bottom of the inning. Josh Morgan greeted reliever Ryan Harris with an opposite field single to right. Jairo Beras struck out and Jose Trevino hit into what should have been a game-ending double play. However, shortstop Javier Guerra botched the grounder and had to settle for a lone out at first. A passed ball by David Sopilka put Morgan at third. With pitcher Scott Williams on deck (the DH was killed when Meyer left the game and Trevino was inserted behind the plate), Greenville chose to walk Tendler intentionally to get to Williams. However, Michael De Leon – who did not start because of a sore quad – pinch-hit and took a four-pitch walk. Shoulders then worked an 0-2 even before hitting a blooper into shallow left. A trio of Drive players chased it down before Devers got to the ball for what looked like a game-ending, over-the-shoulder catch. However, the ball hit off of Devers glove for a single that scored two runs to give Hickory the win. Rock Shoulders: Both the game-tying and game-winning at-bats came out of 0-2 counts. In the ninth, he caught enough of an 0-2 fastball to steer it well to the left of second baseman Yoan Moncada, who fielded cleanly and threw to second for an out. In the tenth, he ignored a fastball and a change just off the outside corner and then looped a fastball opposite field to left. Kelvin Vasquez: Threw his second-straight solid outing of the homestand Wednesday. Needed only 45 pitches to complete 3.2 solid innings (2 hits, 1 BB, 4 K). Fastball ran 96-98, but it was the ability to throw offspeed pitches for strikes that set him apart for the second straight outing. Entered the game in the fifth with the bases loaded and one out. Stuck out Mike Meyers on a 96 heater up, then got Nick Longhi to pop up a curveball. He came back in the sixth and got back-to-back Ks on sliders. Missed four bats (by my count) on either curves or sliders, six on fastballs. Scott Williams: Homer aside in the tenth (on a slider), he’s pitching with more confidence in attacking the strike zone. He is able to throw the slider for called strikes, or just off the plate enough to get hitters to chase. His fastball is ranging 94-96 with good movement. Josh Morgan: Appeared to make a mid-game adjustment that paid off in the later innings. In the first, he pulled an outside fastball for a 6-3 grounder. In the third, he missed a fastball away for a strikeout and in the sixth it was a breaking ball away that did him in. But in the eighth, he slapped a McEachern fastball away into right for an RBI single. In the 10th, another fastball away that was taken up the middle to start the final rally. Corey Ragsdale: While low-A games are seemingly devoid of strategy much of the time, he took a chance get the winning run across in the ninth. With his only two bench players (Michael De Leon and Eduard Pinto) nursing leg injuries, Ragsdale sent in pitcher Chris Dula (who was a batting champion in college) to pinch-run for the slow-footed Jonathan Meyer at first. This happened despite the fact that the other catcher, Jose Trevino, was the DH. Hickory tied the game in the ninth, but stranded the go-ahead runner at third. When Tendler came up in the tenth with two outs and a runner on third, Ragsdale sent Williams – the pitcher – to the on-deck circle. Greenville called the bluff and intentionally walked Tendler. De Leon came in to hit and never saw a strike in loading the bases with a walk. Accentuating that perhaps De Leon could not run well, Ragsdale sent in Joe Filomeno to pinch-run for De Leon. Shoulders followed with the single. Jairo Beras: A tough night at the plate after sitting out a game for not running out a fly ball in Monday’s game. Sliders away were the culprit for his three strikeouts. However, on the two comebackers he hit, Beras noticeably busted tail down the line and made both plays close. Two-strike counts: The inability for both sides to close out hitters was costly. McEachern allowed Shoulders to get enough on an 0-2 fastball to pull it deep in the hole at second and allow the run to score. Shoulders also battled out of an 0-2 hole to get the game-winning bloop hit. Crawdads starter Nick Gardewine had an especially hard time closing out hitters. Guerra saw ten pitches after starting 1-2 on his AB in the second. On a six-pitch AB in the fourth Guerra finally got a fastball he could handle and sent it into the RCF gap for an RBI double to score Meyers, who had started the inning with a single on an 0-2 fastball. Devers chased Gardewine with a sharp single on a 1-2 change. Gardewine had a 93-95 fastball much of the night that was mixed in with sliders and changes. But many of the pitches were on the outside corner to RH hitters, who eventually were able sit on the pitches and hit them opposite field. All four hits by RH hitters were liners to RCF or RF. Gardewine needed 85 pitches (65 strikes) to get 11 outs. Devers homer against Williams was on a 1-2 slider that caught a lot of the plate. Reed Reilly: Not a high-velocity pitcher (sat 89 much of the night) but located the fastball around the plate and mixed in his breaking balls well enough to throw off the Crawdads timing. Mainly stayed away from hitters, but threw enough inside to keep them honest. Only Profar and Meyer really squared anything solid against him. Javier Guerra: Had a good night at the plate with the long ABs against Gardewine. Drilled a first-pitch 98 mph heater from Vasquez for a single in the eighth and another sharp grounder to first in the 10th. However, a botched double play in the tenth kept the inning alive. 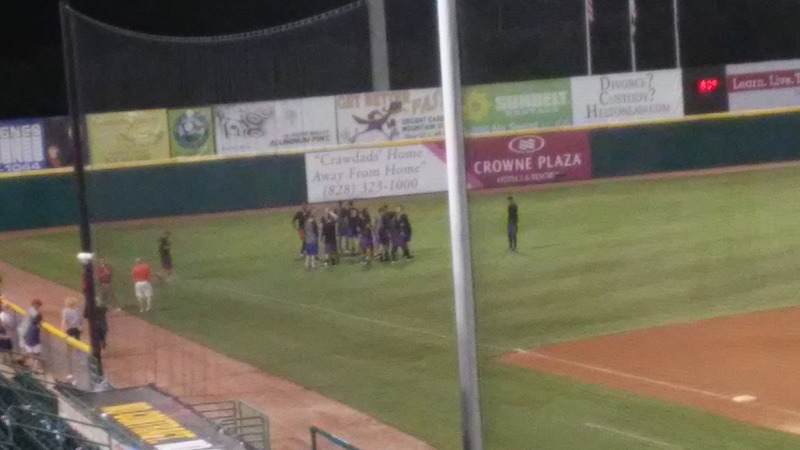 In the same manner as the 2011 team did, the Crawdads milled about in left field, waiting to find out if they had indeed clinched a first-half division title and a playoff spot in September. When the final out in Charleston, WV sealed the Power’s elimination, the celebratory water coolers were spilled and the raucous, rowdy party was on. It was cool to see these toughened, young men melt into excited boys again, delirious at what they had accomplished as a group… and oh, how they celebrated as a group. 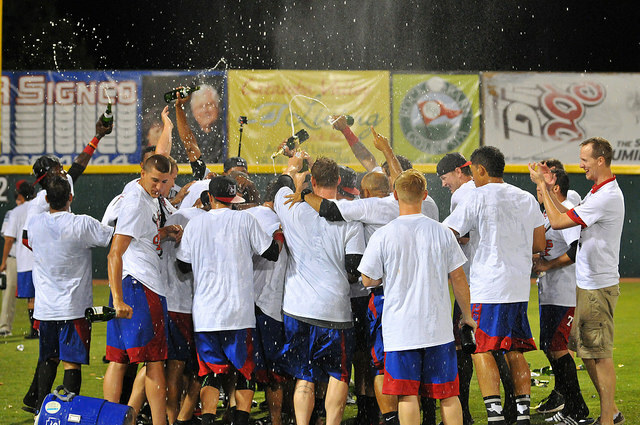 From the two-year vets, such as Wiles and Beras and Mendez and Pinto – who couldn’t believe he finally homered with Hickory – to the “young pups” Ortiz, and Jurado, and Morgan, to the steady Trevino and Tendler and Martin, to Buckel – who did this same celebration in 2011 – to the newcomers, Arroyo, Shoulders, Filomeno… they all reveled in the spoils of victory. Whether in English or Spanish, on this field, their words shared a common meaning: champions. They proudly smiled for the cameras, arms extended with index fingers pointed to the sky to have their baseball moment frozen in time and recorded for a lifetime. They patiently tried to answer my questions, but mostly they spit out words of their happiness… and doused the interviewee. Many congratulations to the 2015 Crawdads on a brilliant first half. Here is some of what they had to say. It’s a credit to these guys. They just find ways to win. It’s not necessarily the two guys that we would expect to hit home runs right now. Jairo, a single with two outs and Shoulders gets a home run. J-Mo gets a double with two outs; Pinto got him with a home run. Give credit to the guys, they find ways to win. Just watching the way that the guys played and the way they cheer for each other. You look into the other dugout and you see guys sitting down. You look at ours and guys are cheering for each other and staying on the rail. Just seeing guys who want to win and pull for each other. My mentality today was to basically go out and compete like I always do and give it my all. I’ve got eight, nine guys behind me protecting me. Attack the zone and they’ll make a play for you. That’s the way it was tonight. I threw the ball over the zone and I felt like everything was working for me. The first and second innings were the hardest ones to get through. It was hot and humid, but I had to go out there and pitch. To become a good pitcher, you’ve got to go through everything. You go through the hot. You go through the cold. You have bad outings. On days you have bad, it’s how you handle it. It’s just pitching, basically putting it altogether and going out there and competing and giving it all you have. If they hit you, it happens. it’s a part of baseball. I’m happy today. I play good. I’m part of the playoffs. We’ll get back at it tomorrow and *&^@-ing win it (Ironically, he did with a homer in the 10th Tuesday night.). I’d never hit a home run with Hickory. My team kept saying to me, “you need a La Bamba; you need a home run. You don’t have one.” I said, “ok, take it easy, take it easy, my brothers.” Today, home run, I’m happy. It’s awesome We did this in Spokane last year when we won the first half and it’s cool to do it again and experience it again. We all have another year under our belt of pro ball, so we’ve all improved and gotten better each day. It’s just a lot of fun to do it with these guys. This is awesome, but we’re not done yet, though. We’re not even close. We’ve got a whole other half and then we’ve got the whole post season. This is a really good team with a group of really good guys. The pitching staff and hitters, we’re all coming back together. I was just looking for a good pitch to hit. Luckily he gave me one and I was able to square it up, luckily. I’m just happy that we clinched, but we’re not done yet. We’ve got a full half to go, but we’re excited about where we’re at right now. Hopefully, we can keep going on and keep staying positive we’ll be successful. I’m happy to be here and hopefully we can finish it off. At my first at bat, he gave me a first-pitch fastball, so I went up there ready for it. I might’ve been a little bit late, but I still got good wood on it. I did what I wanted to do; I was trying to go the other way with the fastball and hit it into the gap. Luckily I got it up over the fence and got it out. At the beginning, I was a little worried, being that it was my first time going to this organization. But this is a great group of guys. When I walked into spring training, they all welcomed me with open hands and open mouths; they were all talking to me and helping me get used to everything. So, when I came here, I knew a bunch of guys already, so it was easy for me to get acclimated. 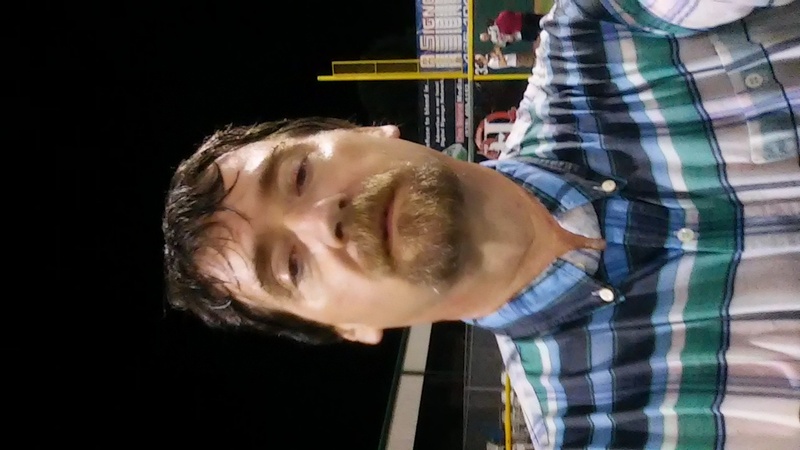 Crawdads Assessment: Interview with Manager Corey Ragsdale. The Hickory Crawdads are off to one of the best starts in the 23-season history of the club. Going into Sunday’s game at Augusta – which will mark the halfway point of the “first half” – the Crawdads are 25-9 and sit 5 ½ games ahead of second-place West Virginia Power. Hickory returns home Monday to face the Power in a three-game series. I spoke to Manager Corey Ragsdale after the finale of the last home stand on Tuesday to get an assessment of his team a quarter of the way through the season. When the team comes back from this road trip, you’ll be at the halfway point of the first half. I’d like to get your assessment overall. You’re 31 games in and you’re still at single digits in losses (22-9 at the time of the question). Overall, that’s not a bad thing. Ragsdale: No, it’s always a good thing when you win some games. Obviously, it’s a credit to the guys the way they’ve been playing. It hasn’t been quite as good as of late, but the pitching has actually picked up a tick lately and carried us a little bit. But, that’s what good teams do, they find a way to win and lately, these guys have grinded out some games and found a way to get it done. I’m not sure how every night, but they’ve been able to do it. It’s a little nerve racking at times, but looking back, yeah, it’s been a pretty good first 30 games. Let me ask you about the pitching. The starters have pretty much night in and night out given you five or six innings and hold them a lot of times to zero or one run, and no more than two for the most part. Ragsdale: The starters have been awesome. Anytime you can get pitching like we have, it makes life a lot easier. Jurado, a 19-year-old kid, has been going out there and working that sinker. All of the other guys have just fit in and followed along and done very well. Collin Wiles putting up zeroes left and right. He’s stepped his game up and is a little bit of a different pitcher that we saw last year. Obviously Ortiz is very talented and has done very well so far this year. You know what, I think one of the things our guys do is that they compete. That’s been one thing we’ve been trying to work on with these guys is competing for the other guys, even if you don’t have your best stuff – competing for the other guys that are trying their hardest, too. That starts with the starting pitching. Everybody else sees the starters going out there and grinding it out and putting up zeroes and doing the best that the possibly can. It breeds a good feeling. It breeds a winning atmosphere. It breeds a determination where all the guys kind of pull on the rope in the same direction. It’s been really run and we’ll see how long we can keep it going. What’s been the biggest surprise so far in that area (Pitching)? I know you expect they will all do what they do, but the reality is they don’t. Ragsdale: You hope they go out and do well. To be honest, at the start of the year I just wasn’t sure about some of the guys – as it always is at this level, the first year out and a full season and all that stuff – but you’re not quite sure how guys are going to come out of the gate. But for the most part, everybody has been pretty good. All those bullpen pieces that we’re running out there – and a 17-inning game (vs. Savannah on May 9) gets us out of whack a little bit – we’re able to run guys out there every night that are putting up zeroes and holding onto what the starters have done. I guess the one thing I would say is that no matter who you would put in what situation, they’ve been able to get that job done for the most part. Whether it’s guys you weren’t sure about and they wind up at the back end of the bullpen and they’ve handled it fine, or vice versa. Guys that maybe you thought were going to be a one-inning guy that maybe you’ve had to stretch out and they gave you three zeros and they gave you a chance to win. I think that would be the biggest surprise is that no matter what the situation you’ve been able to put the pitching staff in, they’ve come through. You mentioned Wiles earlier. He’s sort of seemed to figure out what kind of pitcher he is. He’s not going to blow it by guys and realizes that now, and he’s okay with getting the contact. Ragsdale: Yeah, I think you’re right. I think he’s just going out there confident in what he has now, knowing what he has, and working what he has. Like you said, he’s not trying to blow fastballs by people. He knows he’s going to be in the low 90s or upper 80s and he’s going to need to mix in the other stuff to go with it. And he’s been able to do that. He’s mixed in three pitches for strikes any time he’s wanted. At this level, if you can do that you’re going to be pretty good. Obviously, he’s still working on some things, but he’s got a feel to pitch and that helps out for sure. At the start of the year you had seven out of 11 position players that were here before. Then you add (Luke) Tendler and (Jose) Trevino and a couple of nice pieces in that mix. For the most part, this has been a lineup that has done some damage. Ragsdale: To start the year, they swung the bats well. And you know everybody’s not going to hit .420 all year. So, some of the guys are coming down off of that a little bit. Losing Guzie (first baseman Ronald Guzman), obviously, was good for him, and it’s good for the rest of these guys, too. It gives the other guys a chance to hit in the middle of the order and stuff like that. But, I think losing Guzie and some of those guys kind of coming down off of that high to begin with, they’re kind of finding themselves a little bit more right now. I think they’ll settle back in. With Luke and Jose and Tripp (Martin) for the most part in the middle of the order and Jairo (Beras) there on the back end, I think they’ll be alright and they’ll be able to put some stuff together. Obviously, Travis (Demeritte) staying up front and in the middle of the lineup. We’ve got some guys that can do some things, for sure. You get those guys in front of them on base, they’ve got a chance to drive in some runs. They’ve got a chance to be good and we’ll see how it continues. It looks like Trevino has been a keystone in a lot of ways. You see him get a key double today (during a decisive 8th inning rally in a win over Savannah on May 12) and you see him jacking the guys up and suddenly there’s a different feel to that inning. Ragsdale: No doubt. He’s a special kid. He likes to compete. You want guys like that behind the plate. He brings good energy. He competes. He wants to win. He wants to make the other guys better. It just so happens he’s swing the bat really well and catching pretty good too. When all of that stuff comes together, you get a pretty good player. That’s what he’s been. He’s been really good for us. He’s been hitting in the four hole most of the year and catching. He’s been a big part of that pitching staff as well. We kind of put a game plan together and he helps those guys follow that game plan and get through it. He’s been a huge part of that success so far. (Jairo) Beras is back after an extended time away with the quad injury and a brief inactive period. How has his progress been? Ragsdale: It’s good. Early, it looked like he was pressing a little bit the first game or two that he played. He had the leg injury. I think what that did is that allowed him to go back to Arizona, rehab that a little bit and allow him to settle down. He got into some games down there to get him ready before he came back. He’s been better. What we’d like for him to do is to continue to build off that second half he had last year and see where he develops throughout the year. I think he probably put a little pressure on himself early and I think he’s kind of settling down into that. He’s going to be fine. In the field, you’ve got essentially three shortstops playing in the infield and they’ve done yeoman’s work helping that pitching. Ragsdale: We’ve talked a lot about that – about how defense gives the pitcher confidence to throw it, and pitchers getting up there and how throwing it keeps the defense in the game. Obviously, with Mikey (Michael De Leon) at shortstop, he’s a special kid with those hands, and then J-Mo at third – just learning to play third, but has done unbelievably and done an outstanding job handling the transition to third. Obviously he’s going to play short, too. Travis has been really solid at second base making plays to his left, to his right. He’s been a little bit more focused, I think, this year on the defensive end than maybe he was last year. He’s into the game a little bit more on the defensive side. He’s talented and now his talent plays and now he’s ready and now he’s into the game and his talent plays a little bit better. He’s been very good. And then you’ve got Kiner (Isiah Kiner-Falefa) that can play any position on the infield. For me being an ex-infield guy, it’s a lot of fun to work with those guys and to see those guys. They have done an outstanding job. Obviously when you pitch like we’ve talked about and you play defense like we’ve talked about, that’s a pretty good recipe to be in a lot of games. You mentioned De Leon, who is only 18, but in his second year here is carrying self like a little veteran. Ragsdale: He’s a special kid, for sure. He has an awareness about him in the field that reminds me of (Jurickson) Profar defensively. Ragsdale: He’s got the intangibles that go along with the hands and the feet and the defense. A lot of people look at him and see how small he is, and maybe how week he is. Offensively, he’s never overmatched. He always puts good ABs together. No matter how hard they throw, they can’t get a fastball by him. He’s just offensively and defensively a pesky guy that never goes away and is always in the right spot doing the right thing, it seems like. I think you hit the nail on the head with the intangibles. Kind of what everybody saw in Profar, Mikey definitely has that.